Keto Taco Cups Appetizer + Keto Taco Bar! Looking for the easiest keto appetizer recipe? 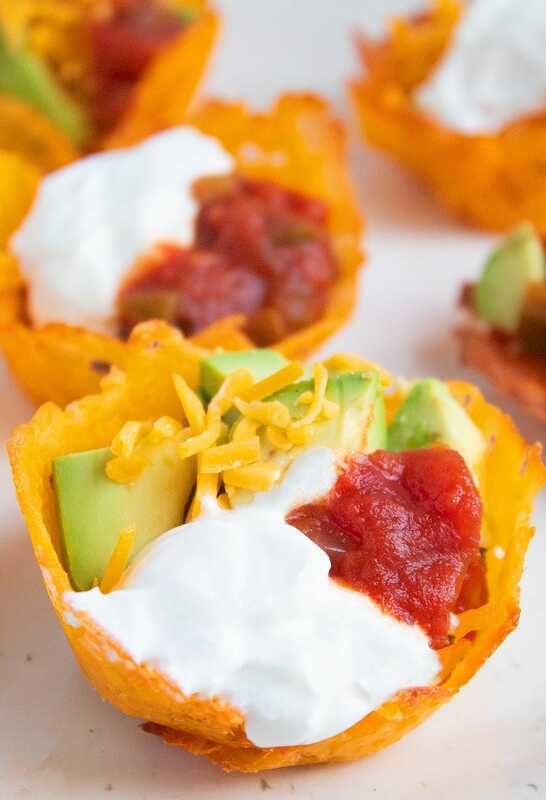 These zero-carb Keto Taco Cups are easy to make, unbelievably tasty, and so fun to eat! Plus, learn how to set up your own keto taco bar. Whoever first decided to make taco shells out of cheese deserves an award for the most brilliant recipe ever. It’s simple yet revolutionary and has probably led to a million “duh, why didn’t I think of that? !” comments over the years. I was perusing some muffin pan recipes the other day and came across a recipe that used baked parmesan cheese to make mini cheese cups, and the thought struck me to go the cheddar cheese route and make mini Keto Taco Cups instead. (I thought this was sooo original until I fired up Google right before starting this post. Turns out I’m not the only one who thought this was a great idea!) They were a huge success. 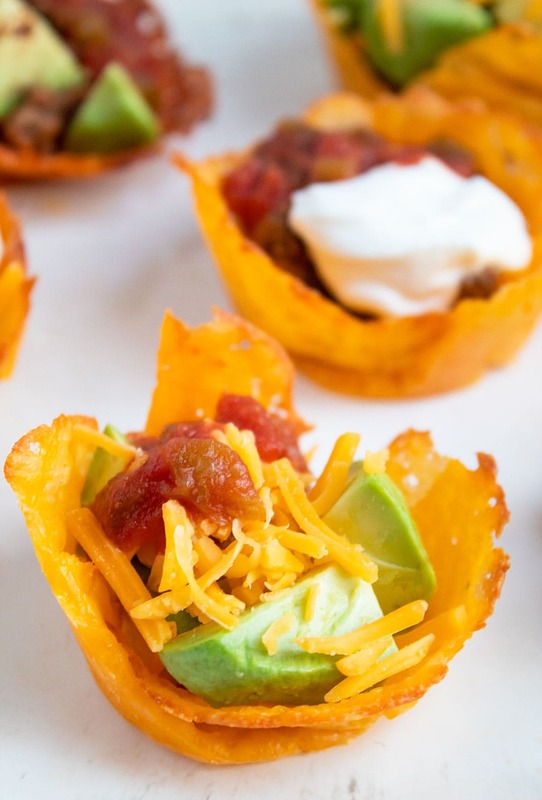 Why You are Going to LOVE Keto Taco Cups! They are SO easy to make, unbelievably tasty, and so fun to eat. They make the perfect keto appetizer. Everyone will love them, keto or not. I had some taste-testers (aka family ;)) over and we devoured a dozen of these in the blink of an eye. They are perfect for a keto taco bar! You can make them plain or seasoned. 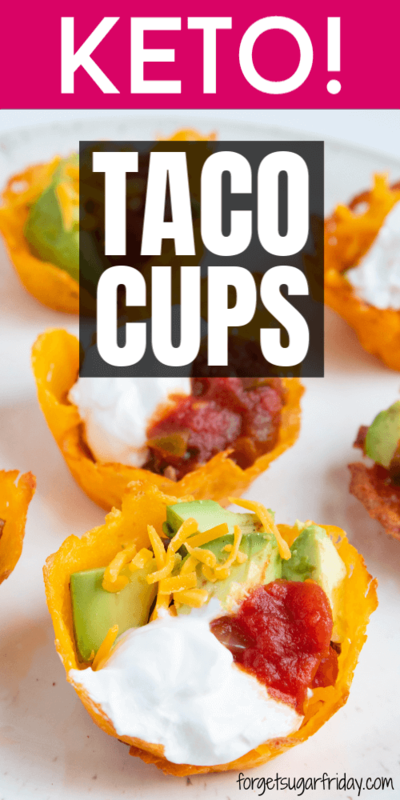 In this post, I’ll show you how to make Keto Taco Cups and I’ll show you where to find my easy Keto Taco Seasoning recipe for the ultimate keto taco experience. Kitzini Silicone Baking Mat: These mats are great for easy clean-up! You do NOT need non-stick cooking spray if you use these mats. 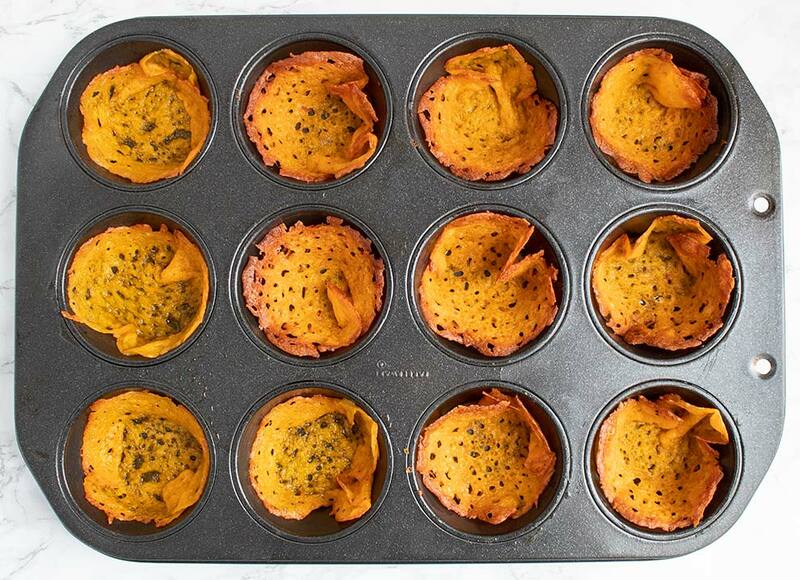 Keliwa 12-Cup Silicone Muffin/Cupcake Pan: I love the convenience of this muffin pan. If you use this pan, you do NOT need non-stick cooking spray. Step #1: Preheat oven to 350 F.
Step #2: The easiest way to make these is to use a cookie sheet covered with a silicone baking mat, as well as a silicone cupcake pan. If you aren’t using silicone, coat your cookie sheet and cupcake pan with non-stick cooking spray (or oil) for easy removal of the cheese cups. 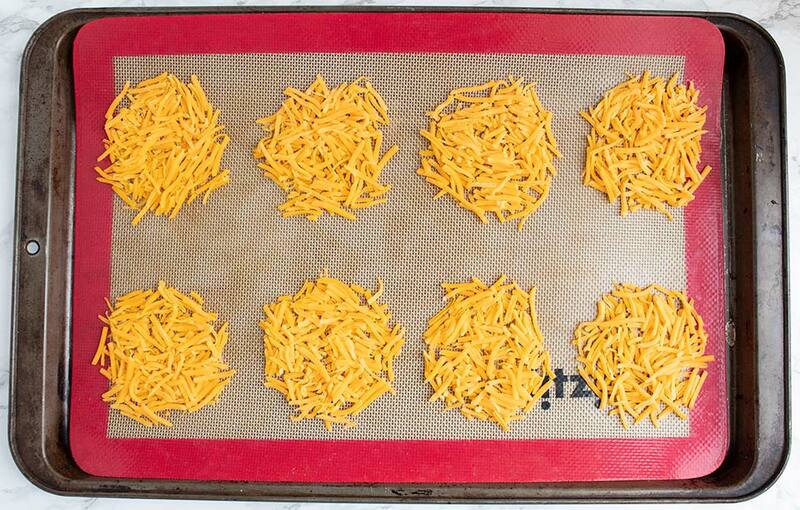 Step #3: On your cookie sheet (preferably covered with a silicone baking mat), make eight circles using shredded cheddar cheese. Each circle is made from 2 tbsp cheese and should be approximately 3 1/2″ in diameter. Tip: I read a great tip online to make the circles “lacey” (as in, leave some space between some of the cheese shreds) for the crispiest shells. You can see that I did this in the photo below. 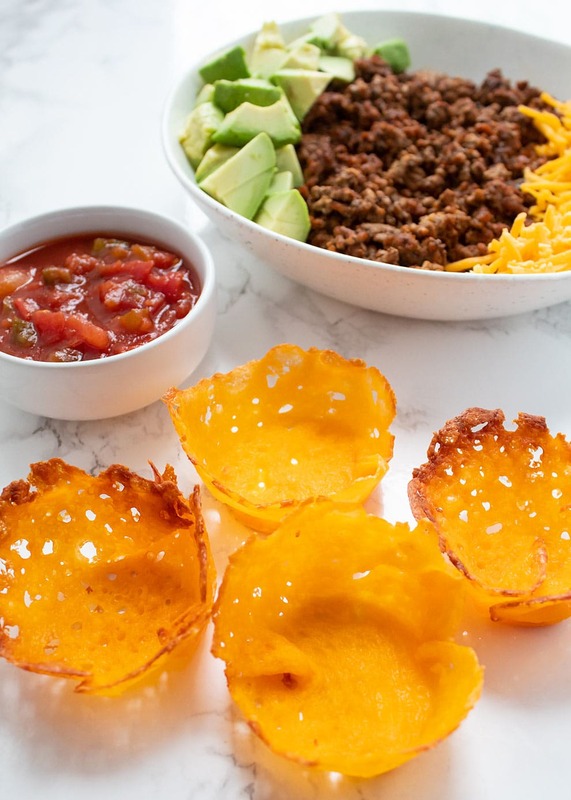 Tip: To make taco-seasoned Keto Taco Cups, mix one cup shredded cheese (the amount you’ll use for eight taco cups) with 1 tsp Keto Taco Seasoning. Step #4: Place cookie sheet in preheated oven and bake for 5-7 minutes until edges begin to brown. Tip: Feel free to experiment with the 5-7 minutes baking range. I baked the cheese in the above photo for 7 minutes, which significantly browns the edges and makes them quite crispy, but they’re prone to breaking on the edges. In the muffin pan below, the cups in the left-most row were baked only 5 minutes. The cheese baked only 5 minutes was (as you would expect!) much more pliable when I pulled them off the cookie sheet and didn’t have any breakage issues, but they didn’t end up as crispy. I preferred the 7-minute cups. Step #5: Remove cookie sheet from oven, let cool for 10 seconds, and then carefully remove each cheese circle and place inside a muffin pan slot to form a cup. Tip: If some of the cheese circles begin to harden before you can remove them, place the pan back in the oven for a few seconds to make them pliable again. Step #7: Let the Keto Taco Cups cool inside the muffin pan for at least 10 minutes before carefully removing the cups and filling them with desired fillings. You’re in luck… I have a recipe for that! 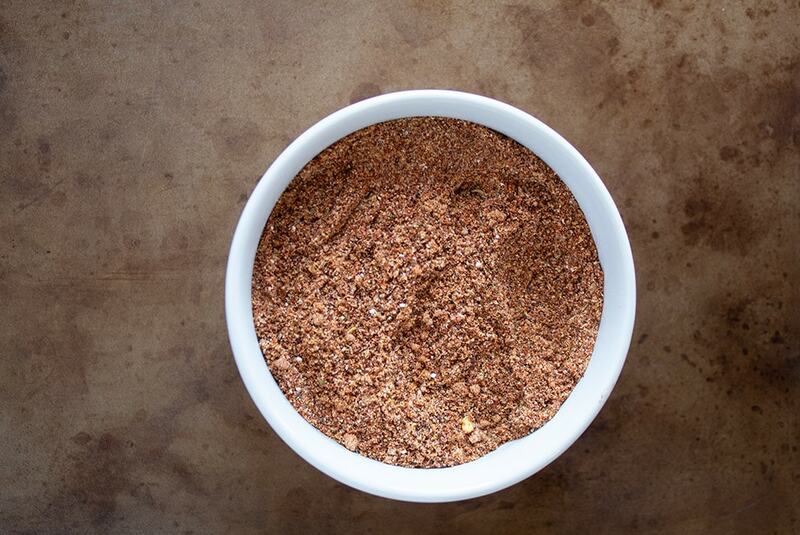 Just head on over to my Keto Taco Seasoning recipe for a keto-friendly taco seasoning that will take you only two minutes to make. What to Serve in Your Keto Taco Cups Appetizer + Keto Taco Bar Idea! Seasoned taco meat (beef, turkey) — or skip this if you want to make vegetarian keto tacos! 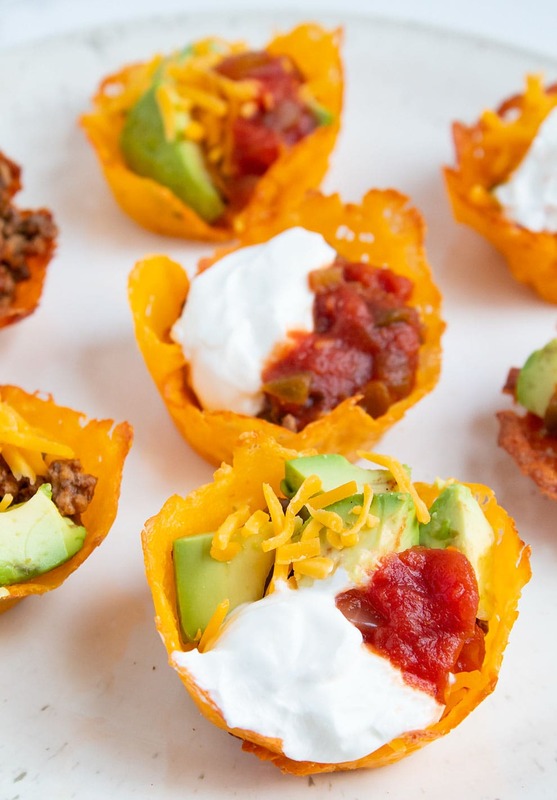 These Keto Taco Cups will certainly become a go-to recipe in your household. They’re just too good to resist! For another easy keto recipe, make sure to try my Keto Crusted Buttery Chicken Casserole. I hope you love these mini keto tacos! If you liked this post, I would so appreciate you giving it a share by using the social sharing icons. THANK YOU! Looking for the easiest keto appetizer recipe? 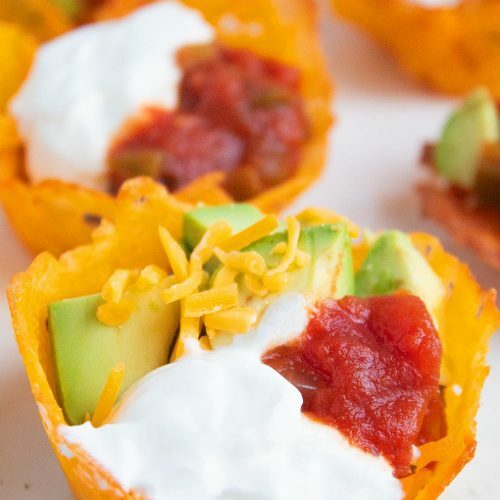 These Keto Taco Cups are easy to make, unbelievably tasty, and so fun to eat! Plus, learn how to set up your own keto taco bar. The easiest way to make these is to use a cookie sheet covered with a silicone baking mat, as well as a silicone cupcake pan. If you aren’t using silicone, coat your cookie sheet and cupcake pan with non-stick cooking spray (or oil) for easy removal of the cheese cups. 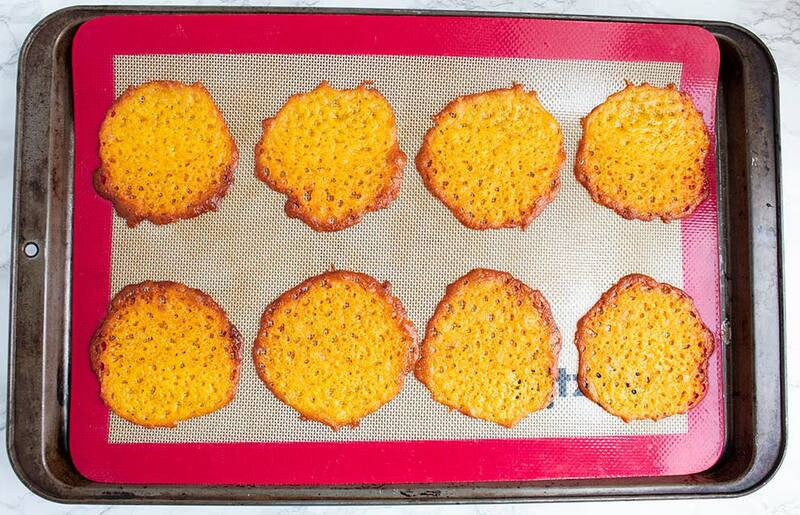 On your cookie sheet (preferably covered with a silicone baking mat), make eight circles using shredded cheddar cheese. Each circle is made from 2 tbsp cheese and should be approximately 3 1/2″ in diameter. Place cookie sheet in preheated oven and bake for 5-7 minutes until edges begin to brown. Remove cookie sheet from oven, let cool for 10 seconds, and then carefully remove each cheese circle and place inside a muffin pan slot to form a cup. Let the Keto Taco Cups cool inside the muffin pan for at least 10 minutes before carefully removing the cups and filling them with desired fillings. I read a great tip online to make the circles “lacey” (as in, leave some space between some of the cheese shreds) for the crispiest shells. 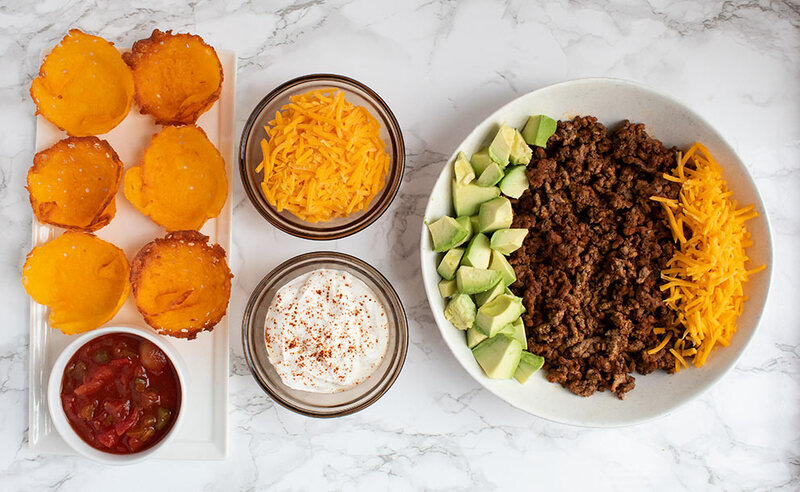 To make taco-seasoned Keto Taco Cups, mix one cup shredded cheese (the amount you’ll use for eight taco cups) with 1 tsp Keto Taco Seasoning. Feel free to experiment with the 5-7 minutes baking range. I baked some cheese for 7 minutes, which significantly browns the edges and makes them quite crispy, but they’re prone to breaking on the edges. The cheese I baked only 5 minutes was (as you would expect!) much more pliable when I pulled them off the cookie sheet and didn’t have any breakage issues, but they didn’t end up as crispy. I preferred the 7-minute cups. If some of the cheese circles begin to harden before you can remove them, place the pan back in the oven for a few seconds to make them pliable again. Keto + Low Carb Pancake Mug Cake!